Summer is blazing by with warm temperatures and lots of activities at the farm! 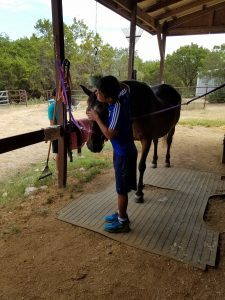 This week was summer camp and our riders paired with volunteers from Week of Hope Austin. Monday thru Thursday just flew by and riders were sad to leave all their new found friends. DADTH can’t thank our private donors and the support of Hill Country Water Gardens and GIVETalent enough for making it possible for riders to attend camp. Please support these generous companies in Cedar Park and let them know just how wonderful they are to supp0rt us!!! We have a Mini Camp Monday and Tuesday of next week and then Spark Learning will be out with their campers on Thursday and Friday! If you would like to come out and volunteer, we would love to see you! Contact Brenda for more information. Until next time…..have an awesome day!!!! Horse hugs are the best!! !